At our last Mass together on Wednesday, at the church of the Infant Jesus of Prague, Monsignor Bastress recalled his ordination 60 years ago the following day (Thursday). How honored we were to help him mark the occasion. He humbly recalled lying prostrate before the altar, the bishop’s hands on his head … and suddenly he was a priest of God. It’s not that one always feels worthy of a vocation, Monsignor Bastress said. When God calls, he said, we set our compass in his direction and set forth. Such a call and response also serve as an apt summary of the two men we have crossed an ocean to honor. St. John Neumann of Bohemia and Blessed Francis Seelos of Bavaria set their respective compasses for the New World, crossing the same ocean under conditions far more perilous than our own. Not least among the lessons we’ve learned during this pilgrimage is to persevere in the face of hardships. Our own journeys in life may not involve 40 days at sea nor plagues of yellow fever, but they are fraught with perils nonetheless. To persevere means less reliance on self and more trust that God will light our way. To reach the church where we celebrated the end of our pilgrimage, officially known as the Church of Our Lady of Victory, we took a stroll through Prague’s past — from Josefov, the historic neighborhood of a once thriving Jewish population; into Old Town, graced by Italian Renaissance architecture and flooded with tourists; and across the centuries-old Charles Bridge over the Vltava (Moldau) River. Hearing how the bridge and other buildings became populated by statues of saints suggested another answer to the question I’ve asked of several guides: Why Czechs and their next-door neighbors in Poland (home of Blessed Pope John Paul II) differ so sharply in professions of faith. Not only did Bohemians adopt an early form of reform Protestantism under Jan Hus, they fought and lost the Thirty Years War (1618-1648) for the right to practice it. Then, under the Austrian emperor, Bohemia was forcibly “re-Catholicized.” The story called to my mind other abuses of power: forcing Jews to be baptized in earlier centuries and forcing Christians to empty the churches under Soviet occupation. And yet there are signs that faith in God is awakening once again among Czechs, as if Christianity in general, and Catholicism in particular, is emerging from a long period of dormancy. Distant relatives of mine tell me some churches in Prague are full for Sunday Mass, including one attended by university students. Traditional devotions are also reviving. Pilgrims, especially from Latin America, flock to the shrine of the Infant Jesus. 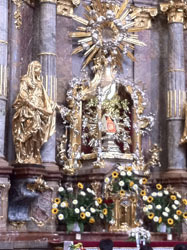 For centuries, pilgrims have venerated the statuette of a young Jesus brought to Bohemia from Spain in the 16th century. Plaques attached to the wall on either side of the shrine attest to miraculous powers of intercession. 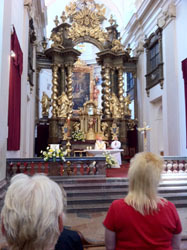 We also visited Loretta, a Marian shrine near Hradcany Castle that resembles in structure the complex at Svata Hora. It contains a replica of the Santa Casa (Holy House) in Loreto, Italy. Our final stop: the soaring Gothic-style St. Vitus Cathedral. Construction began in the 1300s but halted with the Protestant Reformation. Half the interior was sealed off and services held in the other half. Finally completed in 1929, its rear stained glass windows were designed by some of the finest artists of that time. The Wenceslaus Chapel contains the tomb of St. Wenceslaus (903–935), the patron saint of Bohemia and the Czech Republic. Also here: The tomb of the beloved St. John Nepomok (1340–93), for whom St. John Nepomucene Neumann was named. How blessed has been this pilgrim experience. Martha H. Fitzgerald of Shreveport, LA, is a former journalist who has written a series of columns about vocations that were recently republished on catholicexchange.com. She is also blogging about her studies in the four-year Catholic Biblical School: Catholics & Bible Study: Sharing Our Journey through the Wilderness. Fitzgerald is editor and publisher of the award-winning novel, Letters to Luke: From His Fellow Physician Joseph of Capernaum, written by her late father Dr. Joe Holoubek.